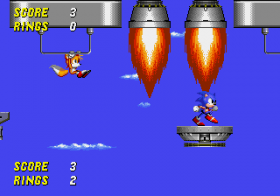 Sonic 2: Battle Race is a hack of Sonic the Hedgehog 2 for the Sega Mega Drive by ColinC10 that allows two players to compete with each other on multiple stages. The hack handles this similarily to Micro Machines as the player must reach the edge of the screen first to win a point. Whoever has the most points at the end of the round is declared the winner. Level select and debug are available without the need for a cheat code. All zones are playable except Sky Chase and Death Egg. 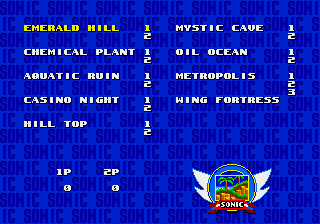 Note that this hack is two player only. Pause + : Quit the current level and return to the level select. Pause + : Kill both players and return to the last checkpoint. Pause + is handy for "standoff" situations, where the players can't progress (they fell off a MTZ nut, for example) but they don't want to backtrack for fear of losing a point to their opponent. Monitors work the same way as in split screen mode, but with an extra life giving you an extra point instead. 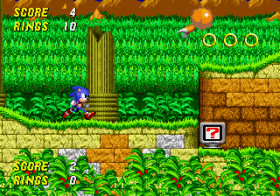 Knowing the level layout is important, particularly in the later levels. In Level Select, you can hold and to activate Debug for a level. You can do everything Debug mode can do, but the camera tries to focus on both players, so it's hard to keep track.